Barbara Bush was the wife of 41st President of the United States, George H.W. Bush. She served as the First Lady of the United States from 1989 to 1993. She is also known as the BUsh Mother and the founder of Barbara Bush Foundation for Family Literacy. She is also the mother of 43rd President of the United States, George W. Bush. 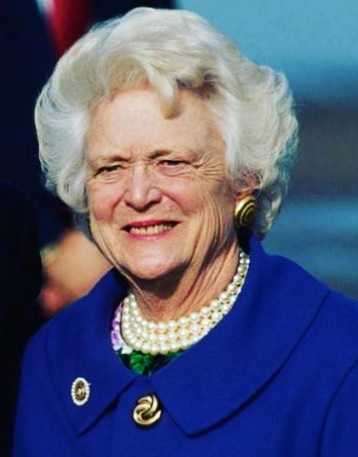 Barbara Bush died at the age of 92 on 17 April 2018. She was one of the popular and favorite First Ladies, as she avoided controversies. She is the recipient of several honorary degrees and was given The Miss America Woman of Achievement Award for her contributions in literacy programs. She was one of the most favorite First Lady of the United States. As the 41st President of the United States, George HW Bush passed away on 30 November 2018, at the age of 94, he has reunited with his beloved wife, Barbara Bush and their daughter, Pauline Robinson Bush, who died at the age of 3 due to leukemia. Clarion Ledger cartoonist Marshall Ramsey paid tribute to the late President by reuniting him with his loved ones via a heartfelt cartoon. The cartoon shows Bush flying a plane through the clouds, who is welcomed by his beloved wife and daughter saying "We Waited For You". It was the plane he flew in the Navy during his military services in the World War II. George HW Bush became the long-living President. His wife Barbara Bush died on 17 April 2018, at the age of 92, whereas their daughter Pauline Robinson Bush died of leukemia in 1953, at the age of 3. 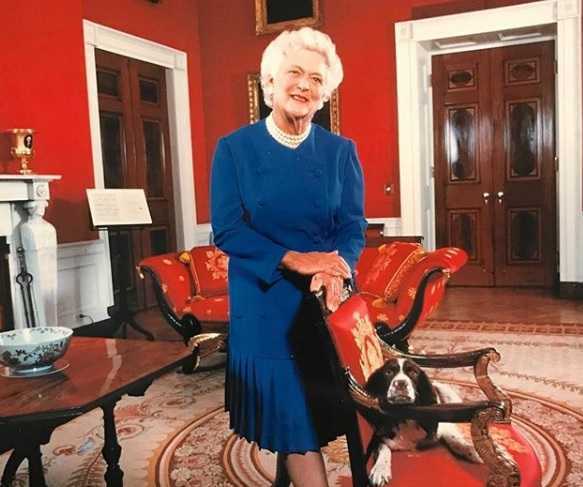 Barbara Bush was born as Barbara Pierce to Marvin Pierce and Pauline Pierce. She was born on 8 June 1925. Her birthplace is Flushing, New York in the United States. She has 3 siblings, Martha, James, and Scott. She grew up in the suburban town of Rye, New York. She attended Milton Public School, Rye Country Day School, and Ashley Hall boarding school. She was athletic while growing up and enjoyed swimming, bike riding, and playing tennis. Her interests in reading also began at her young age. Barbara's husband George HW Bush was a businessman before entering into the politics. Barbara and George moved to Odessa, Texas, where George started the oil business. They moved to several places struggling to establish their oil business. After George entered politics in early 1960, Barbara accompanied on all of his business and political affairs. Barbara's interest in philanthropy grew more after her husband became the U.S. Representative in Congress from Texas. Barbara and her husband moved to People's Republic of China in 1974, as her husband was appointed Head of the U.S. Liason Office by Gerald R. Ford. They stayed there for three years. Barbara started giving inspirational speeches and presentations to overcome her depression, caused by isolation of their relationship when her husband was appointed Director of Central Intelligence. She also volunteered at a hospice. Barbara became the Second Lady of the United States when George became the Vice-President. She served as Second Lady of the United States for eight years. With her son Neil diagnosed with dyslexia, Barbara initiated interest in literacy charities. She also wrote a children's book, C. Fred's Story, named after their dog, C. Fred in 1984. George was elected 41st President of the United States in November 1988, as Barbara became the First Lady of the United States. As a First Lady of the United States, she involved herself in several literacy organizations and founded Barbara Bush Foundation for Family Literacy. She served as honorary chair as she remained active in the Foundation during her lifetime. She worked in the White House Historical Association to revitalize the White House Preservation Fund, later renamed White House Endowment Trust. She became the first U.S. First Lady to become a recipient of the Henry G. Freeman Jr. Pin Money Fund. She received $36,000 fund, out of which she donated most the charities. After serving as a First Lady, they spent their time in initiating, establishing and helping different social organizations. Several schools and hospital are named after Barbara Bush. The Bushes founded the "George and Barbara Bush Center", which lays the foundation for their heritage. Barbara also campaigned her son, George W. Bush's presidential campaign. Barbara Bush married George HW Bush on 6 January 1945 at the First Presbyterian Church in Rye, New York. They first met at the Round Hill Country Club in Greenwich, when Barbara was 16 years old. They have six children, 14 grandchildren, and seven great-grandchildren. Their children are George Walker Bush, Pauline Robinson Bush, John Ellis "Jeb" Bush Sr., Neil Mallon Bush, Marvin Pierce, and Dorothy Walker "Doro" Bush Koch. Their second child, Pauline Robinson died at the age of three of leukemia in 1953. Barbara was diagnosed with Graves' disease in 1988. She was a heavy smoker. She quit smoking in 1968. She was also diagnosed with congestive heart failure and chronic obstructive pulmonary disease (COPD). Following deteriorations in her health conditions, Barbara died at the age of 92 on 17 April 2018 in her home in Houston. Former Presidents of the United States and some foreign leaders expressed their condolences. On 21 April 2018, her funeral was held at St. Martin's Episcopal Church in Houston and was buried at the George Bush Presidential Library in College Station, Texas. Barbara Bush's mother died in a car accident in September 1949, in New York. Barbara could not attend her mother's funeral as she was pregnant with her second child. She named her newly-born child, Pauline Robinson Bush in the honor of her mother. She wrote a children's book, C. Fred's Story in 1984, named after their dog, C. Fred. During her time at White House, the residence staff considered her the most friendliest First Ladies over others. She was one of the popular and favorite First Ladies, as she avoided controversies.